MTV‘s new summer TV show Finding Carter really got me. I’ve seen a couple of trailers and promos ahead of the official release and I couldn’t wait to finally watch an entire episode. Luckily, they started off with a double feature showing the first two episodes at once and giving the audience the possibility to really get into the topic, which is actually quite heavy for a summer show, but nicely interrupted by humerous scenes. So, you’re probably wondering, what the show is about. It is about a 16 year old girl, Carter, who finds out that she’s been abducted at the age of three and that her mother, whom she loves dearly, therefore isn’t her real mother. She now has to return to parents, grandparents, a twin sister and younger brother who are complete strangers to her. Yet, this isn’t your typical family-re-uniting-and-all-is-good type of story, because Carter loves her mother and just wants to be with her instead of staying with the overly controlling detective who is her real mother, but intends to hunt down the woman Carter loves. Clearly, this is bound to lead to a bunch of problems. I think the show really starts of interesting, because you understand both sides. The loss the family went through and never really coped with on the one hand, while on the other hand you also get that Carter’s life was great and that she never wanted anything to change. I absolutely cannot wait to see how this show will continue and how the side plots will develop. Next to the main issue, you’ve got a lot of love-triangles (or love-pentagons, if such a thing exists) and money problems and deceit in general. I didn’t know a lot of the actors and actresses besides the parents and a couple of the teens, but everyone seems to be cast really well. The show includes appearances of Kathryn Prescott, Cynthia Watros, Anna Jacoby-Heron, Alexis Denisof, Zac Pullman, Milena Govich, Alex Saxon, Jesse Henderson, Caleb Ruminer, Vanessa Morgan, Eddie Matos, Jesse Carere and many more. Also, like in Teen Wolf, Faking It and Awkward, the music of the show is really great. The theme song is by MisterWives and called Vagabond, but the rest of the songs are also selected very well. As I said, I can’t wait to see more. Have you watched it? If not, you can check out the trailer below and if you’ve seen it, give me your thoughts! Yay! That’s exactly what I wanted to achieve! I really like the show and I think it has potential. Yeah, ever since they started with Teen Wolf, they’ve been on my tv show radar haha. I also like Awkward (except for the last season) and I really like Faking it as well. You really are a little behind, but it happens sometimes. Have fun binge-watching though! thanks 😉 Summers are exactly for that! I guess I should be happy that, after moving to reality TV shows after leaving music behind, MTV is moving towards dramas that mean something. By the way, are you watching the new season of Teen Wolf? And absolutely! I wouldn’t miss teen wolf for anything! What do you think about the new episodes? I see a lot of people hating on Malia and I don’t think that’s fair. Stydia is probably going to be endgame anyway, so just relax for now. I think Malia’s scenes are mostly hilarious. I like Malia, though I’m not sure her relationship with Stiles will remain romantic for long. I’m more concerned about the new beta that Scott probably has on his hands now. And that wendigo thing! That was terrifying! Poor Liam is going to have a lot more to deal with in high school than grades, sports, and girls, that’s for sure. Yeah, you’re right. I’m also not sure about Stiles and Malia’s relationship. Scott’s never turned anyone before so that’s gonna be interesting. I just hope that the Mexican hunters don’t find out about it anytime soon. This is going to be one heck of a difficult year for them. No kidding! I hope nobody dies too early! I don’t want any more people to die! I mean a lot will with that supernatural assassin hanging around, but I hope the main cast survives this season. Me too. Though if I had to put money down at this point on who will die this season from the main cast, I’m going with Malia and Liam, with possibly Derek later on. I actually don’t think Malia will die. I think they’ll want to drag out the Peter-Malia-storyline for a while. Liam might really be a candidate. I also heard that there’s going to be another new character, a teacher or so, and teachers are prone to die in Beacon Hills. I really hope that Derek won’t die. Also, I’d like to see Cora return, but I doubt that will happen since Adelaide Kane is busy with Reign. I also wouldn’t be surprised if Peter or Kate die…again. Very true! I actually sort of like Peter, but definitely not Kate, so I wouldn’t mind if she disappears again. I doubt anyone would miss her. She’s a character you love to hate but it’s better she remain out of the picture. I thought this was really well done! I got addicted really quickly and kept waiting for the next episode. I hadn’t expected this from MTV at all and I am not even entirely sure how I started watching – it was about episode 7 or so, and I just watched the entire thing in a row. The cliffhanger was absolutely brilliant. MTV really got a lot better with their TV shows over the past years. I can’t wait for season 2! I actually didn’t watch anything MTV did except this one – I might have been a bit prejudiced about it. Anything else you recommend watching? I really love Teen Wolf! It’s one of the shows I am a 100% addicted to! Other than that I sometimes watch Faking It and Awkward., but they are not nearly as good as Finding Carter. So, I’ve been totally avoiding Teen Wolf – I’ve been a bit traumatized by teen/supernatural dramas thanks to the horror that is the Twilight franchise. Having said that: after being put off YA novels/movies as well due to Twilight, I eventually gave in and checked out The Hunger Games, loved it, and have been buying ton of YA dystopia and fantasy series ever since. So the said Wolf might redeem on-screen supernatural creatures for me, too. I will give it a shot. (if you like Twilight, I do apologize). To my shame I will admit that I used to like Twilight. I can feel you losing respect for me, but let me explain. I was really young when I first found out about it, I then read the books and actually enjoyed them, but as soon as the movies came out I started hating them. I don’t know what the reason was, but it became sort of a ritual to go to the movie with my cousin and just make fun of it. So, not a fan of it at all anymore. I was actually about to say that it’s probably the age difference 🙂 I didn’t read the books first, just went into the first movie because there was such a big hype and I did totally enjoy that type of thing when I was a teenager, circa the Buffy era. I thought the movie was horrible, and then actually did go and check out the first book because I was wondering whether the movie itself was bad or the source material was bad too. I thought the book was terrible as well, but at this point I have been spoiled by the movie. I do like the guy, though. Albeit possibly in less pale incarnations. I had friends trying to drag me to the sequels (and even tried to bribe me) and I refused. But I do have to admit that I sometimes run into the special editions of the movies – I like buying and collecting limited editions of films I like – and they are so nice I consider buying them just because the set is pretty. Shallow me. Pretty sets and covers are very important. 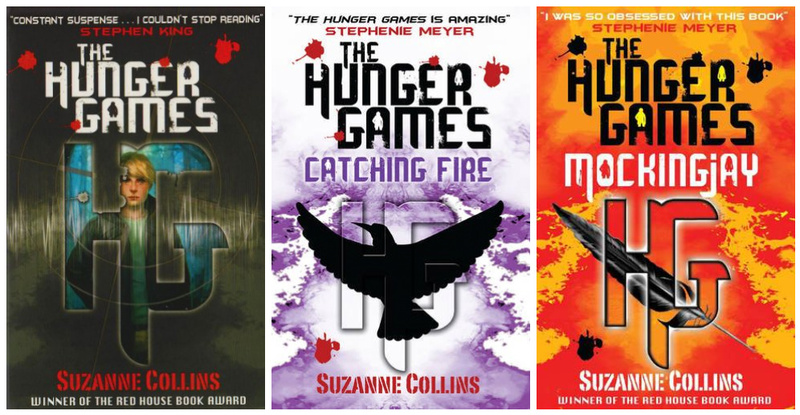 I have editions of the Hunger Games I don’t like very much and I honestly consider buying them again, just because the other covers are more beautiful! It’s one thing to do it when it’s something you love and another when you don’t even like it! I am planning on re-buying some of my Merlin DVDs though. The ones I bought from Amazon UK are great, but the US releases are ugly. I do love the story of the Hunger Games, I just don’t like the covers I have at home. They look terribly childish. Yes. I can see the problem. I’ve got the US covers, which I really like. (and then really nice releases of the two movies, because like I said: shallow). All the other covers are more beautiful than those! But at the time I bought them, they were the only one’s that even existed in my country. Can’t you order from Amazon.com? I ordered most of my stuff from there even before I lived in the US. I also order from Amazon UK quite often (living in the US but being an avid British TV viewer will do that to you), and it’s usually pretty cheap. They do have it in my bookstores now, I just can’t afford buying them right now that’s all.